Ubisoft’s absurd release schedule, which was going to see The Crew, Assassin’s Creed Unity and Far Cry 4 all release not only in the same month, but within a week of each other, has become a wee bit more sensible. Unity and Far Cry 4 will still arrive on the 13th and 18th of November, respectively, but The Crew has been pushed back to December 2nd. “Our philosophy remains to deliver the best game possible. 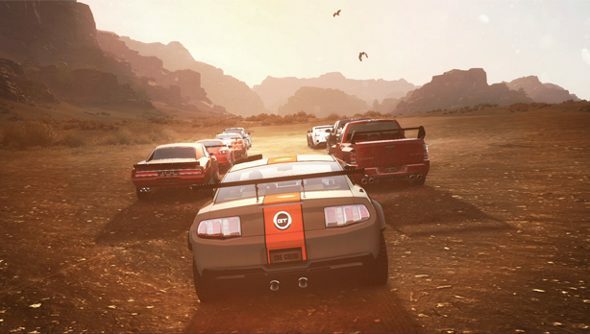 We’re all committed to delivering a revolutionary experience in the driving genre and we can’t wait for The Crew to be in the hands of the players.” said creative director Julian Gerighty. This postponement means that there’s room for another beta. Unfortunately, this is just for the console lot and will be restricted to Xbox One and PlayStation 4. It still strikes me as a bit bizarre to see what are undoubtedly three of Ubisoft’s biggest 2014 games launching within the same of a month. The Crew is obviously quite distinct, but Far Cry and Assassin’s Creed overlap quite a lot, sharing a lot of the same structure and objectives. Do you lovely lot think you’ll have room for both in your life this year?